On April 26, 2017, some smarta*!se journalists wrote a Bloomberg piece – The Brexit Banker Exodus Gains Momentum – with some not-so fancy graphics purporting to show where the “U.K. banking jobs might be headed” allegedly because Britain is to leave the European Union. On May 9, 2017, the increasingly terrible UK Guardian bought in on the frenzy with its article – City banks could move at least 9,000 jobs from UK due to Brexit . And so it goes. Apparently, Deutsche Bank is “leading the threatened exodus”, followed by JP Morgan and Goldman Sachs. All exemplars of virtue, not! While the threat of the ‘City’ leaving London is now used to frighten British people about Brexit, the reality is, in my view, quite different. I would be celebrating the cleaning out this infestation of unproductive enterprises, which remain one of the destructive legacies of Margaret Thatcher and, later, New Labour and its so called ‘light touch regulation’. Speculators may do no harm as bubbles on a steady stream of enterprise. But the position is serious when enterprise becomes the bubble on a whirlpool of speculation. When the capital development of a country becomes a by-product of the activities of a casino, the job is likely to be ill-done. The measure of success attained by Wall Street, regarded as an institution of which the proper social purpose is to direct new investment into the most profitable channels in terms of future yield, cannot be claimed as one of the outstanding triumphs of laissez-faire capitalism — which is not surprising, if I am right in thinking that the best brains of Wall Street have been in fact directed towards a different object. That was in 1936. We take a long time to learn, don’t we? In 2015, they followed it up with a paper published in The British Journal of Politics and International Relations, written with Duncan Wigan an academic – The Finance Curse: Britain and the World Economy. The Finance Curse is an interesting application of the so-called Dutch Disease. I have written about the Dutch Disease in previous blogs (search if you are interested) in relation to the impact that our mining sector has on the prosperity of our manufacturing and agricultural sectors. The Dutch disease, which takes its name from the impact that the discovery and exploitation of North Sea oil had on Dutch agriculture, refers to the way in which exchange rate movements impact in a disparate fashion on the export side of the economy. In Australia’s case, our repeating mining booms push the Australian dollar up which undermines our export competitiveness and damages our other exporting sectors (such as manufacturing) which are not experiencing the same commensurate increase in world demand that mining enjoys at the time. The appreciating currency: (a) damages the competitiveness of ‘import-competing’ sectors (dominated by manufacturing, service and agricultural firms) because import prices fall relative to local cost levels; and (b) promotes wage pressures which further damage sectors who are not enjoying buoyant demand conditions. The ‘Dutch Disease’ or, as it is sometimes called the “Resource Curse” is typically associated with depressed rates of growth, a loss of investment in new productive capital replaced by ‘rent-seeking’ (quick profits), increasingly unbalanced economic development with rising suspectibility to crisis, rising wealth and income inequality, declining productivity, and increased poverty rates. There are exceptions to the rule (such as Norway) but they are usually because the government maintains tight regulation and has well-developed redistribution policies in place within communities that maintain solidarity and a concern for equity. … centralised wage formation and income coordination … a ‘local content’ policy of trying to build up domestic supply chains for the oil industry … heavy investment in education, research and development … active countercyclical economic policies … other labour market policies … other industrial policies to diversify exports … expansion of the public sector to boost employment. Without these strong government interventions, the consequences of the “Resource Curse” produce a very unattractive cocktail. This World Bank study (May 2012) – Natural Capital and the Resource Curse – provides an interesting account of the role of government in attenuating the curse of resources. But these destructive outcomes are not confined to nations dependent on their extractive industries. The “Finance Curse” outlined by the Tax Justice Network authors is a version of this syndrome and runs counter to the usual (special pleading) that the financial sector is indispensable and its departure will cause untold damage to Britain. The argument for the utility of finance is well-rehearsed. Liquid and deep financial markets reallocate capital from savers to borrowers, ensuring that funding is directed to those best able to use it … Financial systems act as efficient information processors, centralizing the dispersed knowledge of market participants to generate prices reflecting economic fundamentals. More finance completes markets ensuring an efficient competitive equilibrium … Finance cannot cause harm since market movements mirror but do not drive changes in the real economy … Speculation is ultimately stabilizing … Hosting a large financial sector represents the high road to economic success. The sector provides quality jobs and sizeable fiscal dividends to host states. Finance-dependent countries perform well in international rankings of income per capita. Given this, governments should focus on growing the financial sector. This was the neo-liberal argument that was used by Margaret Thatcher to promote the ‘City’ in Britain as she was hacking into the more traditional working class sectors such as mining and manufacturing. Theh GFC exposed the lie. It turns out the finance sector is largely unproductive – shuffling wealth between gamblers. But it is worse than that, which is what the “Finance Curse” is about. First, the growth of a country’s financial system is a drag on productivity growth. That is, higher growth in the financial sector reduces real growth. In other words, financial booms are not, in general, growth-enhancing, likely because the financial sector competes with the rest of the economy for resources. Second, … we … find that credit booms harm what we normally think of as the engines for growth – those that are more R&D-intensive. This evidence, together with recent experience during the financial crisis, leads us to conclude that there is a pressing need to reassess the relationship of finance and real growth in modern economic systems. And it is clear that one couldn’t hold out the BIS as an exemplar of progressive thought. So things must be bad! Countries overly dependent on an outsized financial sector display similar characteristics. Britain, whose financial sector is the world’s third largest, and the largest by a composite measure of size and interconnectedness, is a case in point. 1. “crowded out manufacturing and non-financial services”. 2. “leeched government of skilled staff”, not to mention other sectors. 7. “helped disenfranchise the majority”. What is the worry if they all pack up and go then! On April 28, 2017, the British Trades Union Congress released some analysis – London and the South East set to account for 40% of the economy by end of next Parliament, says TUC. They produced these estimates based upon the official Statistical Regions in the UK. I added the Population proportions to their data to scale it a bit but there is no need for proportionality given the fact that industry composition is different and productivity rates will vary as a consequence. 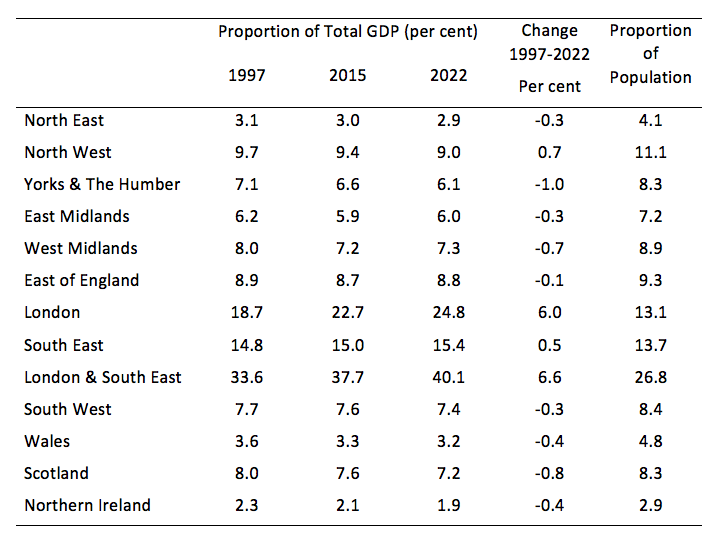 The regional imbalances in the UK are thus predicted to worsen over the next 5 years. The TUC says that there is a need for more public infrastructure investment in regional areas to enhance private investment, targetted public procurement “to improve jobs and pay”, increased investment in renewable energy, increased investment in low pay sectors to increase productivity etc. The following map provides a different view of the same data. First, the huge inflows of foreign capital into the City (much of it destined for mergers and acquisitions and real estate purchase rather than new investment) has served to prop up the pound Sterling, raising prices (look at UK property price inflation since the 1970s) and making it harder for other exporting sectors to compete on the global markets. This exchange rate/inflation effect is similar to the Dutch Disease that resource-dependent countries suffer from. Second, high salaries in the financial sector have a ‘brain drain’ effect, attracting a large proportion of university graduates away from other sectors of the economy and forcing those other sectors to compete against the highly inflated remuneration packages offered by banks and law firms in London. Third, oversized financial service sectors are prone to damaging cycles of rapid growth followed by bust. According to economist Hyman Minsky, periods of apparently stable growth in asset values breed complacency among lenders and borrowers, leading to rising debt leverage followed by crash. Debt is a major contributor to this volatility, which has worsened in recent decades as a result of the trend towards lax regulation. These negative impacts are “disguised by debt-fuelled growth in consumption”, of the type that dominated the pre-GFC cycle and which the current policy settings in the UK are biased towards. But when the “busts occur the long-term damage caused to other sectors of the economy becomes more apparent, but those sectors are hard to resuscitate, not least because of skills shortages and long-periods of under-investment”. Rather, “any development strategy that aims to rebalance the UK will need to begin with a significant downsizing of the City of London”. The following podcast from the TJN (30:16 minutes) extends the analysis to the US (particularly New York) and shows that the financial sector is “a net drag on their economy”, in the same way that the ‘City’ drags down the UK. In my upcoming new book (with Thomas Fazi) we outline a series of reforms that would constitute a truly progressive agenda. They include bank nationalisation. But we write that these reforms to the ownership and operations of the commercial banking system only go so far. By forcing the banks to return to a retail focus and preventing them from operating as casino players represents a considerable improvement over the current situation. However, there is a vast array of financial institutions that would fall outside the prudential regulation dragnet and which account for the bulk of the global financial transactions. These include large investment banks such as Goldman Sachs and other Wall Street institutions. Throughout the neoliberal era, as a result of financial market deregulation and lack of supervision of financial flows from authorities, the volume of global financial transactions increased from 15.3 times nominal world GDP in 1990 to 73.5 times by 2008. Most of the financial flows comprise wealth-shuffling speculative transactions which have nothing to do with the facilitation of trade in real goods and services across national boundaries. One might characterise these transactions as being simply unproductive. Yet, as the global financial crisis demonstrated, they have the capacity to derail the entire real economy when their engineered speculative bubbles burst. It would be wrong to consider all hedging and speculation to be damaging. When it accompanies trade flows and provides security to a trading concern that has cross-border exposure (either in revenue or costs) to exchange rate fluctuations, it can be beneficial. When we talk about hedging in this context we are referring to a strategy to avoid foreign exchange risk. By entering forward contracts, the producer of real goods and services (for export) or an importer can transfer the risk of unforeseen exchange rate changes to a speculator and it is likely that such arrangements increase the volume of international trade. But these types of transactions are a tiny fraction of the total volume of financial transactions, which are dominated by a few large multinational firms that have no other motivation than to expand their reach and profits. As Matt Taibbi argued, financial firms like Goldman Sachs are “huge, highly sophisticated engine[s] for converting the useful, deployed wealth of society into the least useful, most wasteful and insoluble substance on Earth – pure profit for rich individuals”. The robber barons of the industrial era have been replaced, in the era of financial capital, by the banksters. The question that arises is how a progressive state should deal with this destructive influence. In the same way as universal basic income has become popular among progressives as a solution to income insecurity arising from mass unemployment, the idea of a Robin Hood or Tobin Tax is today championed by progressives as a means of addressing the unfettered greed of these large investment banks and the destruction they wreak, especially among poorer nations. Neither solution is desirable; they both reflect a failure to understand the intrinsic capacity of the sovereign state. The idea of a Tobin Tax is simple. It involves imposing a small tax on foreign financial transactions. Part of the motivation relates to the increasing awareness that short-termism or high frequency trading is now becoming dominant in global financial markets. High-frequency trading is driven by computer algorithms, automatically programmed to follow rules that can generate a multitude of (usually small) trades per second. The resulting asset prices that emerge have little correspondence to any economic fundamentals. Rather they reflect speculation, herding and ‘technical trading’, which can erode the long-term fortunes of companies and economies in general. It is argued that a Tobin Tax would discourage these short-term hot capital flows but not interfere with long-term investments because a small tax would be relatively minor compared to the total scale of these projects. Short-term speculators who move in and out of a currency sometimes within hours of taking their positions would be more exposed to the tax. By discouraging these short-term capital flows, it is argued that exchange rate volatility would decline and significant revenue would be raised, which could be used to alleviating poverty and improve public services and make national economic policies less vulnerable to external shocks. Why is this approach an inferior option for progressives to adopt? First, it would be futile to deter speculative behaviour that assists international trade in goods and services. Second, an important question that is begged by the discussions about the Tobin Tax is why we should allows these destabilising financial flows to occur in the first place. If they are not facilitating the production and movement of real goods and services what public purpose do they serve? It is clear that they have made a small number of people fabulously wealthy. It is also clear that they have damaged the prospects of disadvantaged workers in many less developed countries. More obvious to all of us now, when the system comes unstuck through the complexity of these transactions and the impossibility of correctly pricing risk, the real economies across the globe suffer. The consequences have been devastating in terms of lost employment, income and wealth. So there is no public purpose being served by allowing these trades to occur even if the imposition of the Tobin Tax (or something like it) might deter some of the volatility in exchange rates. Third, the progressives who focus on the funding such a tax would provide governments fail to understand the spurious nature of these arguments when applied to a currency-issuing government. A superior progressive option would be to outlaw all non-productive financial flows. As part of a more general reform of the international institutional architecture, governments should agree to make all financial transactions that cannot be shown to facilitate trade in real goods and services illegal. Speculative attacks on a nation’s currency would be judged in the same way as an armed invasion of the country – illegal. This would smooth out the volatility in currencies and allow fiscal policy to pursue full employment and price stability without destabilising external sector transactions. This would also have the benefit of ensuring greater food security for the poorer nations. One of the most hideous aspects of the speculative mania is the way large investment banks reap huge profits by betting on food prices on financial markets. This drives up food prices and creates shortages, leaving millions going hungry and facing deeper poverty. There is no justification for allowing these transactions to take place. So one part of the British Brexit strategy might be to encourage these banksters to leave as soon as possible! So reflect back on the introductory Keynes’ quote. The point he made in 1936 is even more relevant today. For those fretting that Britain will fall into a mire if the banksters up and leave as a result of the nation leaving the dysfunctional European Union, I would just advise them ‘to have a cup of tea, a Bex and a good lie down for a bit’. The sky won’t fall in. It will be the first step in rebalancing the regional economy in Britain and losing the destructive vortex that is the ‘City’. Why not break the banks up into smaller more competitive units? Makes an awful lot of sense to me. God help anyone trying to make the point during this election though, the reply will just be the financial sector must be incredibly important as it pays so much money in tax. You then have to explain that taxes don’t fund spending and are in no way a measure of a person’s, companies or even whole sectors economic contribution. At this point you’re basically asking someone to listen patiently as you explain why almost everything they believe they know about macroeconomics is wrong. Feels like pushing a boulder up an especially steep mountain. Why do you think the waste of competition would improve the credit analysis process? Where’s the productivity improvement going to come from? Automatic credit analysis and top slicing is part of the problem, not the solution. Can’t it just be done at the individual underwriter level? If you underwrite too many loans that go underwater, your licence to practice is withdrawn. Mountains have tops, and when you get over it, the boulder gathers speed down the other side all on its own. Somebody’s got to push the boulder. So let’s just get on with it. We’ll get it to the top eventually if we work together. There are,where appropriate, economies of scale. The main utility of a banking system is to facilitate payments and these are already centralised to a large degree. The credit functions have metastasized from a management utility into a method of organisation and control. You might not earn much, but you will be granted credit as long as you earn. after that you will be “let go” . Thanks to my advancing years, I can remember the ‘big bang’ that Margaret thatcher was the tribune (but not the designer) of. I can remember when finance was in it’s cage. London became a goldrush town and now that the gold is leaving, we will be left to admire only the excavations. The ‘tailings’ of this mining have poisoned public thought, behavior and expectation. It never flushes the bog after it leaves. My local branch of RBS is closing next month,part of the restructuring of the corporate and the retraining of it’s customers. The teller who has dealt with me over the years, using advanced facial recognition, was pretty upset. These home grown redundancies will be felt far keenly than the gilded migration to frankfurt/dublin/anywhere you can chance it mob. I can’t wait till these parasites are gone. The venue of choice I understand is Frankfurt because costs are much less than London and the alternatives. Great. Send the parasites to Germany. Let them feast on that host for a while. Having said that, I would feel bad for the average German. Because they will get it in the neck (Image intended). Economic theory and policy doesn’t need a tweeked liberal or conservative orthodoxy it requires an intelligent and forward looking financial and monetary paradigm change. Haha, sometimes I imagine what the reaction would be for citizens when a progressive MMT candidate pops their bubble. She could be wrong or everyone in these 30 years has been wrong. I didn’t know what the Dutch Disease was until now. After reading Bill’s blog pierce about what it is, I immediately think about Venezuela. What is happening in Venezuela should be a text-book Dutch disease. Nice to see you call out the financial sector. People pussyfoot a lot around this issue. -Outlawing financial flows via international arrangements does detract from the argument that the nation state act on these issues singularly and isnt a victim to globalisation.isnt their a set of unilateral policies that could be pursued to achieve similar ends.It would be more sustainable. -A reduction in capital flows into sterling would reduce UK’s terms of trade the country imports a lot,it would have to start producing domestically to counter exchange rate led inflation to maintain living standards. In suggesting restructuring the bank industry, I had the Australian system in mind. We have four major banks which behave badly on a large scale with impunity and without effective restraint. They have too much market and political power. They have an inordinately high rate of return on assets because of this power. (And the irony is that the current bank industry structure was put in place by a centrist left government.) Additionally, I don’t believe public control of commercial assets where there is not a significant public good involved is a sensible idea, although it could be argued that better bank behaviour is a public good – but that would be stretching the argument too far. How is this to be done Bill? Given that a farmer or miner needs to hedge his wheat or gold production, he/she is going to need someone to take an opposing position, and this is going to be a speculator. What did Winston Churchill say when Britain returned to the Gold Standard after WWI? Its an age old problem for the British. The City has the ear of the Bank of England and the Treasury. It set’s the economic agenda. Always has done. Why do you think Joseph Chamberlain’s campaign for Tariff Reform came to nothing in 1906? Why do you think Harold Wilson’s interventionist efforts in the 60s and 70s withered on the vine due to a lack of funding and commitment? Why was a devaluation of the pound unthinkable in 1976? The capital flow is created as a natural process of the international clearing system. Sterling deposit is transferred from the customer to the credit of the Euro branch of the same multinational bank. Euro bank then marks up the Euro deposit against the Sterling asset it now has. Euro clearing happens to send Euros to supplier. The balancing Capital flows are created as a side effect of earning fees clearing international payments between branches of multinational banks. From reading the papers, largely because the Labour people in charge didn’t understand we’d come out of Bretton Woods five years earlier. Why not an insurance company, given that’s what they are in the business of doing? of a bailout to shareholders of a failing firm. OF course it will not be “fair ” competition between the monetary sovereign and the private sector. depsosit guarentee for savings can be honored with a deposit in the state bank. No bail outs for failure , no stealing of assets , no curtailment of competition or beurocratic centralism. It would be great to hear a bit more about how you’d define “non-productive capital flows” for the purpose of outlawing same: I don’t have a good sense of what form such a definition would take.. Would there be grey areas? Is some hedging acceptable? Perhaps only by direct producers/consumers, and then only to the extent of their exposure? Etc. Rather than just promoting the Brexit, why doesn’t Bill Mitchell write about some of the Australian problems as far as Neo-liberalism go. Australia is now a virtual tax haven for the very rich; negative gearing, huge tax concessions for super, even tax-free super for the over sixties, dividend imputation, and the family trusts and other tax dodges. Get real! “Bill Mitchell” (alias me) has written three blogs this week out of four on “Australian problems as far as Neo-liberalism go”. I think your analysis is broadly correct. The big problem is that the trade elasticities for demand in the UK are some of the poorest on record. The UK doesn’t even come close to satisfying Marshall-Lerner. According to the current statistics any rebalancing that came through a decline in the sterling would have to be borne by consumers and producers in the form of reduced imports. I understand that these stats need not hold moving into the future. The economy would eventually start to readjust. But it would be incredibly painful. Capital goods are imported, for example. So that would make reconstructing manufacturing that much more difficult. The butchering of the manufacturing sector under Thatcher and New Labour and the rise of finance to support the falling pound have totally hollowed out the British economy. Rebalancing through currency devaluation would be and will be incredibly painful. I don’t look forward to seeing the results. Real living standards are going to get crushed.